Rev. 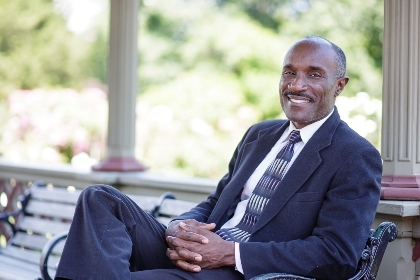 Jabulani McCalister is the Senior Pastor at Calvary Baptist Church in Providence, R.I. He oversees the spiritual well-being and growth of a 300-member congregation. I began my faith journey my junior year in college at the University of Michigan-Ann Arbor. My early church experience was not positive. Fortunately I met some friends in college who showed me a better experience. It was their Christ-like examples that led me to Christ and coming to church. I’m an American Baptist because the ABC family has been a big part of my spiritual growth and development by helping me to discern and allowing me to use my spiritual gifts as the Holy Spirit reveals them. I was a member of Greater Christ Baptist Church in Detroit, Mich., under the leadership of Rev. Dr. James C. Perkins for 16 years. He was the one who introduced me to ABC life. The greatest challenge facing the church today is I believe we have lost the true sense of our purpose – to bring people to Jesus Christ so He can save their souls. We have become social clubs more interested in “growing “our churches instead of growing disciples of Jesus Christ. I pray a great deal about people getting to know Jesus and how their hearts and lives can be transformed through living for Him. I often struggle with looking at all the suffering and meanness caused by spiritual warfare, which I basically define as the fight between followers of Jesus and evil forces (i.e. the devil and demons of life). Paul describes/introduces this battle and how to combat it in Ephesians 6: 10-20 and 2 Corinthians 10: 1-6. Sometimes it seems that love has been depleted from the world because we have chosen death instead of life. I struggle because I wonder how the Lord can let this happen until I realize we all have a choice to make. It’s hard for me to understand why people would choose a life without God. I am most passionate about training up children, youth and young adults to serve the Lord. These groups, especially young adults, have so much to offer but are often ignored by the church. In 10 years, I am concerned the church will become irrelevant in the world’s eyes, even more so than now, unless we have ministry that is relevant to reach people outside of our church walls. We have an answer for those people, but if no one knows about it and lives are not transformed, what’s the point? On the other hand, Jesus said the gates of hell will not prevail against the church He built. So there will always be “the church” because it is not just an organization or building but a living, breathing organism. In other words: the church is the Body of Christ, which will never die (Matthew 16: 18). Would you like to nominate someone to be featured in “My Baptist Life”? Simply send a name, the reasons behind your nomination, and contact information to Mark Staples, ABCUSA communications consultant.